In order to maximize its gains in the fast approaching general elections, Jamiat Ulema-e-Islam-Fazl (JUI-F) has awarded majority of its tickets to wealthy candidates by conveniently ignoring the fact that most of them have joined the party only a week or even a day back. By so doing the JUI-F leadership has completely sidelined its deserving cadre which was hoping to get its nod. 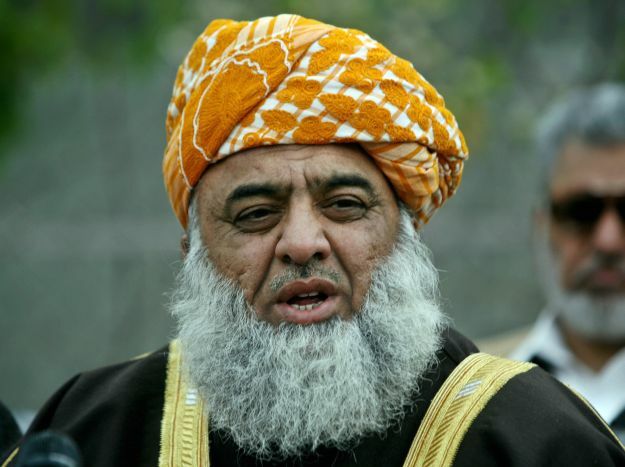 The JUI-F chief Fazlur Rehman, with “Now or never” as his party’s slogan, has managed to attract wealthy and influential politicians from across the province, especially in the constituencies where the party has no roots. While the analysts term the move as desperate, the JUI-F leadership considers this as extending its electoral reach in the newfound political territories. An interesting fact: most of the freshly inducted JUI-F candidates have previously not been affiliated with any political parties, but are now intent on taking advantage of their immense wealth – increasingly a hallmark of the present-day politics. Prominent among those who joined the party in recent weeks is former MNA from Buner Istiqbal Khan, former ANP MPA from Charsadda-1 Fazal Shakoor, former MPA from Kohat Shokat Habib, former PPP MNA Mehboob Ullah Jan from Kohistan, PML-Q provincial president Syed Qasim Shah from Mansehra and Sajjadullah Khan from Kohistan. In addition, former MPAs Zar Gul and Zarin Gul from Torghar, Qaumi Watan Party’s (QWP) Atiqur Rehman, Asrarullah Khan Gandapur from Dera Ismail Khan, former PML-N MPA Munawar Khan Marwat, former JI MPA Anwar Hayyat Khan from Lakki Marwat, former MNA Munir Orakzai, PML-N’s Sajjad Khan Jadoon and Malik Riaz Bannu have also joined the JUI-F recently. The whispers around the KPK province suggest that the majority of former MPAs and MNAs are joining the JUI-F due to the threats of attacks by the TTP to the PPP and the ANP candidates. Another important phenomenon: for the first time since 1997, the JUI-F is going into an election without an alliance. And on that last instance, the party had managed only two provincial seats! Inside sources claim that the JUI-F leadership is worried over the fact that its electoral history without alliances has not been satisfactory. That too necessitated bringing influential people into the party. The word on the ground is that the JUI-F needs to win sizable number of seats as it will be difficult for it to maintain its latent popularity if it could not. Meanwhile, the JUI-F has allocated 10 provincial and two national assembly tickets to such candidates who have been elected or have contested election on other party tickets in the past. Those who will contest on the JUI-F tickets, include Fazal Shakoor from Charsadda PK17, Ayub Khatak from PK- 41 Karak-2, Attiqur Rehman from PK 42 Hangu 1, Zarin Gul from PK 58, Sajjadullah Khan from PK 61, Munawar Khan Marwat from PK Lakki Marwat 75, Anwar Hayyat Khan from PK-76 Lakki Marwat, Said Habib Ali from PK-81 Swat-2, Muhammad Yar Khan from PK-87 Shangla-1. Furthermore, former MNA Mehboobullah Jan will contest on NA-23 Kohistan seat and Munir Orakzai on NA-38 tribal area, while Seth Gohar Saifullah on NA-40 Kohat. Meanwhile, billionaires Javid Khattak and Mehmmod Bitani are contesting for the first time on JUI-F tickets for provincial assembly seats including PK-40 Karak-1 and PK-69 Tank respectively. However, Malik Raiz contesting on PK-73 Bannu-4 seat and Sajjad Khan Jadoon on PK- 36 seat had been affiliated with the PPP and PML-N in the past, before joining the JUI-F. Moreover, the JUI-F has also made seat adjustment with former MPA Sardar Israrullah Khan Gandapur in DI Khan on PK-67 DI Khan-4, Javid Akbar PK-68 and with former minister Samiullah Khan Alizai. Sources revealed that the party leadership’s haphazard decision to include wealthy candidates in the party has created rifts within the party. The areas where the heat of the conflict is more evident include Tank, Bannu, Karak, Shangla, Lakki Marwat, Charsadda, Mansehra and Mardan. As a result of this, the disenchanted JUI-F loyalists are opting to contest the elections as independents. A well known casualty for JUI-F is Maulana Gul Naseem, who has opted to contest on NA-26 Bannu as an independent against former KPK chief minister Akram Khan Durrani. Similarly, Ghulam Qadar Bitani, former JUI-F MPA from PK 69 Tank, will be contesting against Maulana Fazl on Tank/DI Khan NA 25 and on PK 69 against Mehmood Bitani. Meanwhile, former MPA Malik Qasim will contest polls as an independent candidate from PK 40 Karak-1 against party candidate Ayub Khattak, who is a new inductee. Qadar Bitani and Malik Qasim, while talking to Pakistan Today, made identical statements: the JUI-F leadership is ignoring ideological workers, and instead pleasing the rich candidates. They said, the party had earlier allocated tickets to them but later withheld them. On the other hand, in Charsadda, Haji Gul Yousaf and Maulana Musammir Shah will contest the elections independently, while Haji Said Raheem Shah Bacha has been shortlisted for party ticket. Moreover, the district officer bearers of Shangla also opposed the NA-31 ticket given to ex-senator Rahat Hussain and have demanded a review. There are also some differences over the ticket to Muhammad Yar for PK-87 Shangla-1. Though the JUI-F has recently enjoyed popular support by taking an anti-US stance, but it did not aid the party in entering into electoral alliance with any one and the possibility of seat adjustment also seems improbable. However, Maulana Fazl has already made it clear that the JUI-F is an ANP alternate, thereby discarding the possibility of electoral alliance or seat adjustment. So future of KPK Government smells of JUI-F.